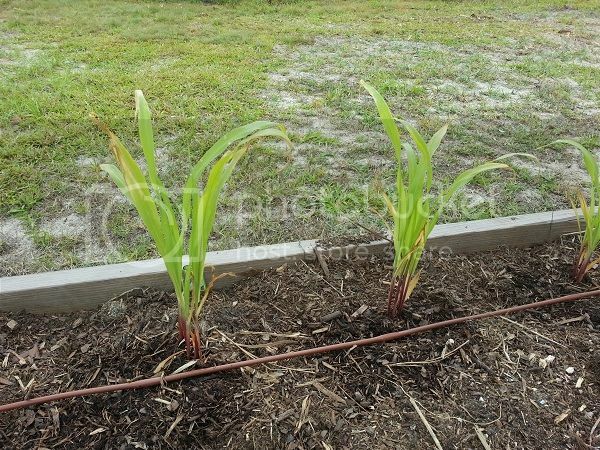 hello all, im from central florida and new to forum.. i am also kinda new to gardening.. 2nd year.. below are pictures of my current corn/cilantro,squash/pepper.. bought from local store about 2-3 weeks ago. any advice would be helpful.. thanks all! Looks like the possibility of low nitrogen and low pH. The soil appears to have a lot of wood chips or fiber in it. If that is mixed into the upper few inches of soil, then low nitrogen could be an issue, as breaking down wood depletes the nitrogen in the soil. Also, for plants that size, 45 minutes of watering every day could be way too much water. 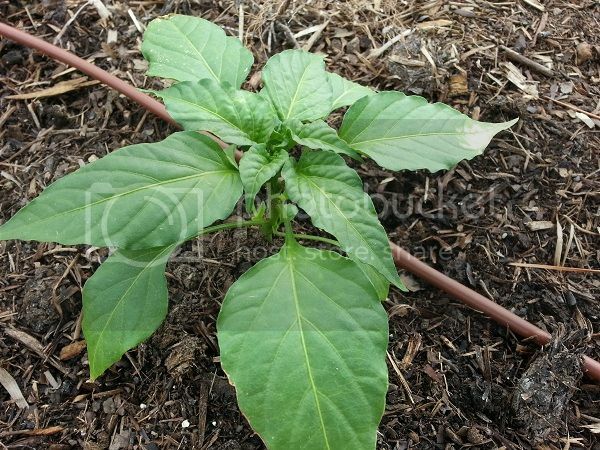 Stick a finger down in the mulch, and only water when the soil is starting to feel a little dry. Excess water will kill a plant quicker than most anything that a beginning gardener is likely to do. You said you bought garden soil. Did you mix the garden soil into your soil or did you just fill the entire bed with garden soil? If you filled your garden bed with garden soil, that may be the problem. Garden soil says on the package that is not a planting mix and is intended to be mixed into your soil. Garden soil should be mixed 50//50 with topsoil in a garden bed otherwise it holds too much water and causes yellowing and eventually root rot. When it dries it shrinks and pulls away from the sides. You still need to add some fertilizer too. You should not need to water 45 minutes every day. If watered deeply like that you should be able to go a few days between watering. As Alex said, feel the soil below to see how wet it is before you water again. You will have to change your watering schedule for the different seasons, but you need to water only as needed. Mulching and the drip system should minimize water loss. 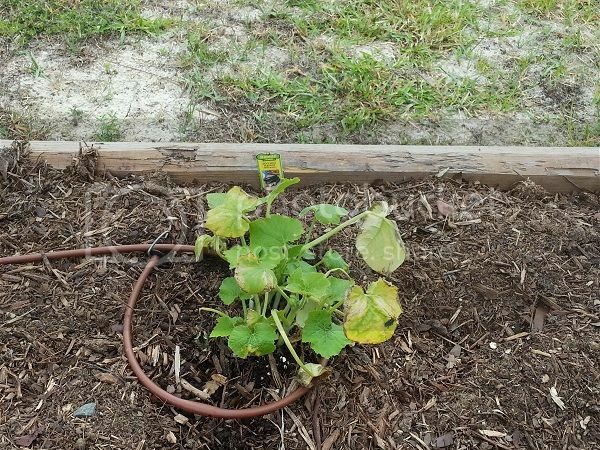 Drip systems are usually run longer and deliver water low and slow, but if the soil is adequately moistened, it still should be able to go a few days. If you have compost, it would be better to add compost and top soil to the garden. 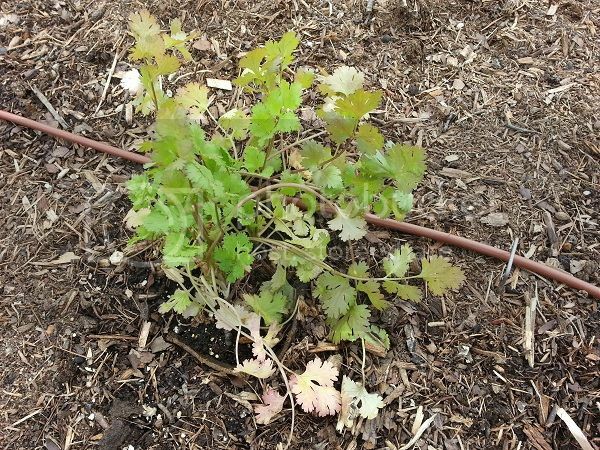 The compost will also add beneficial organisms as well. You would need to include a complete fertilizer or you could go with bone and blood meal if you want to be more organic. Manures should be incorporated 90-120 days before harvest. i kinda figured we were over watering.. we will reduce to 20 minutes (?) each day than (its a drip system)..
- what can i buy at local store to check that level (specific name brand)? - what do you recommend i can add to the garden soil either or both is low (purchase at local store)? For this year, I would just add some slow release fertilizer such as osmocote. It will provide nutrients for 3-4 months. Longer term perhaps consider getting the soil tested and amending with longer term organic products. Osmocote won't burn and will provide any major nutrients that the plants might require. As far as soil pH, I'm sure that Lowes or some nursery would have an inexpensive soil test kit. I agree that your soil probably wasn't rich enough. "Garden soil" in bags is not the same as good enriched topsoil. Watering with the drip hose, the only way to know if you were watering too much is to run it the way you usually do and then dig down and see how wet the soil is and how far down it is wet. Then tomorrow before you turn it on, check the soil again and see if it has dried out any. 45 min every day could well be too much and could account for some of the yellowing you see. But depending on the output of your hose, your climate, your soil, it might not be too much. As was stated, you do want your soil to dry out a little between waterings. The only way to know how you are doing is to check it. The tan area you mentioned in the last picture, might just be sunburn. When plants are just transplanted in to a new area, they can be a little tender. If it is, that leaf will never recover, but the burn will not spread and new leaves that grow will be just fine.